From the attic of a dilapidated English country house, she sees them - Cara first: dark and beautiful, clinging to a marble fountain of Cupid, and Peter, an Apollo. It is 1969 and they are spending the summer in the rooms below hers while Frances writes a report on the follies in the garden for the absent American owner. But Frances is distracted. Beneath a floorboard in her bathroom, she discovers a peephole which gives her access to her neighbours' private lives. To Frances' surprise, Cara and Peter are keen to spend time with her. It is the first occasion that she has had anybody to call a friend, and before long they are spending every day together: eating lavish dinners, drinking bottle after bottle of wine, and smoking cigarettes till the ash piles up on the crumbling furniture. Frances is dazzled. But as the hot summer rolls lazily on, it becomes clear that not everything is right between Cara and Peter. The stories that Cara tells don't quite add up - and as Frances becomes increasingly entangled in the lives of the glamorous, hedonistic couple, the boundaries between truth and lies, right and wrong, begin to blur. 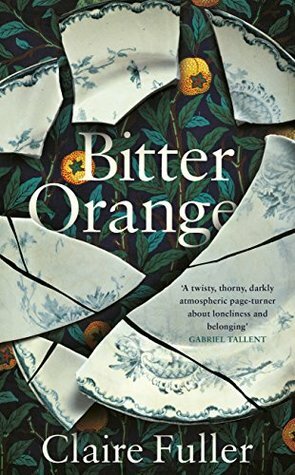 Bitter Orange is a captivating tale of repression and loneliness. Atmospheric and moody, the plot twists and turns, taking us on the journey with Frances as Cara and Peter draw her into their world. The house itself almost becomes a character in its own right, with its buried secrets and its creaks and breaths. The prose is a descriptive delight--so much so that I read the book in a single sitting, unable to put it down. The only slight reservation I had was the lack of clear demarcation between past and present. One bled into the other, and I assume that was an intentional literary device. However, for me, it was a distraction. Each time, it took me a paragraph or two to re-establish where I was in the timeline, pulling me out of the narrative. A simple scene break would have been less jolting, as that is what the eye is used to seeing in such cases. But that is a very minor gripe in what is, in all other respects, a gripping, intelligent, and deep novel. This book gets a strong 4.5 stars from me, and I recommend it to anyone who likes their literary fiction with a dose of atmospheric mystery.